In honor of National Hot Dog Month, we’re traveling to Philly to bring you Philly Cheese Steak Hot Dog! Step 1: Slice the steak a thinly as possible into small strips. Season the steak strips to your taste with salt, black pepper, and garlic powder. Heat a medium skillet to high heat. Add steak strips to the pan and cook until browned on the outside. Deglaze the pan with ½ cup water, and scrape up any bits of steak stuck to the pan. Reduce heat and simmer until steak is fully cooked and the liquid has reduced to almost nothing. Step 2: In another medium skillet add vegetable oil and heat to medium high heat. Add green onion and peppers and sauté until tender. Step 3: Lightly grease an outdoor grill or an indoor grill pan and heat to medium high heat. Grill hot dogs until slightly charred. 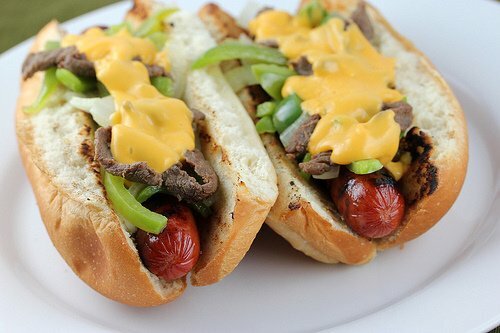 While hot dogs are grilling heat nacho cheese or cheez whiz in a small pan over low heat. Toast hot dog buns cut side down on the grill until lightly browned. 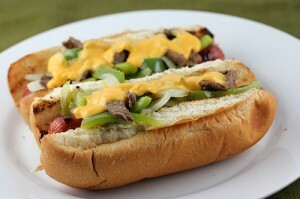 Step 4: To assemble hot dogs- place each hot dog into a bun and top with cheese sauce, steak, green pepper, and onion.